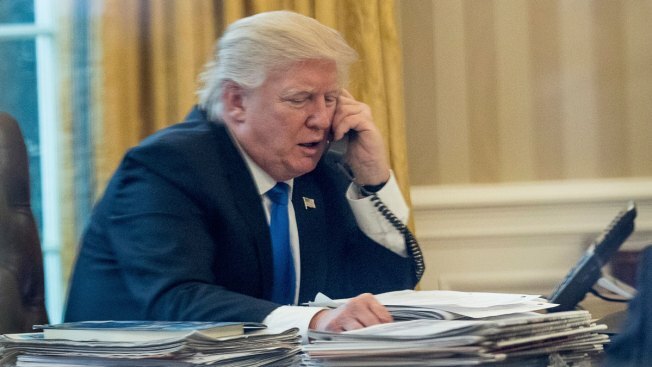 President Donald Trump speaks on the phone with German Chancellor Angela Merkel, Saturday, Jan. 28, 2017, in the Oval Office at the White House in Washington. Trump is expected to pause the flow of all refugees to the U.S. and indefinitely bar those fleeing war-torn Syria. The president's upcoming order is also expected to suspend issuing visas for people from several predominantly Muslim countries — Iran, Iraq, Libya, Somalia, Sudan, Syria and Yemen — for at least 30 days, according to a draft executive order obtained by the AP. Cancellation of the U.S. program could mean Iranians arriving in Austria with temporary visas would seek asylum in Austria. Immigration is a highly sensitive issue throughout Europe, which is struggling to deal with hundreds of thousands of people from Syria, North Africa and beyond.